HP 10s is especially dedicated to middle school students. The HP 10s Scientific Calculator is perfect for mathematics and science courses. The HP 10s allows you to work smarter with both solar and battery power as backup. Use both natural and indoor lighting to extend the life of your battery. HP 10s comes with 2 lines display and more than 240 built-in functions. The Cool HP10S design with a practical slide on hard protective cover makes the 10S an ideal companion for all students. HP 10s easily power through advanced calculations such as statistics and performing complex conversions. Ideal for Algebra and Trigonometry, the HP 10s features a robust advanced mathematics package. HP 10s Part Number: F2214AA. 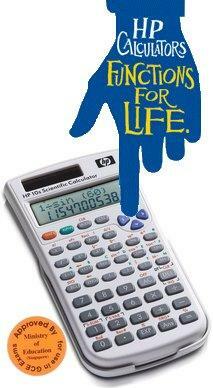 What’s in the box: HP 10s Calculator, slide-on protective cover, battery, user guide. Memory: 9 Independent; 1 Sum; 1 Answer. Power Battery: 1 x LR44 with solar cell, battery life: 3 years (based on 1 hr use per day). Auto power: off 10 minutes. Size: 15.2 x 8.07 x 1.3 cm. Subject suitability: General mathematics, Algebra, Trigonometry, Statistics, Geometry, Biology, Science. Permitted for use on SAT Reasoning and SAT Subject TestsTM in Math 1 & 2, ACT, PSAT/NMSQT, AP Chemistry/Physics, PLAN, EXPLORE*, GCE Examinations. 2007-08-01: Solar Powered HP10S Calculator,Slide-On Protective Cover and Multi-Language Manual.Backup Batteries Included.